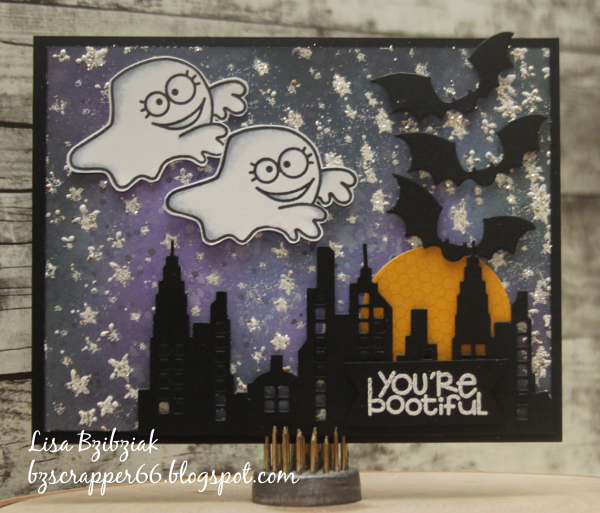 Life of a BZscrapper: Paper Smooches October Challenge! 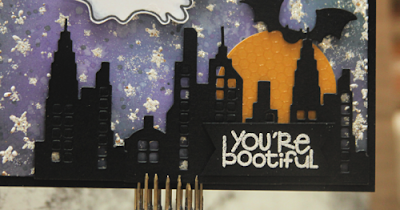 Took a few moments to play along with a fun challenge over at Paper Smooches! The October challenge is a sketch challenge and the graphic is below. I decided to make a Halloween card because I'm also playing along with the Twisted Thursday challenge over at the Outlawz which is any Autumn Holiday and the current challenge over at Double Trouble is Halloween/Fall and they're partnering with the Paper Girls this time around who also have a Halloween Theme so I'm playing along there too! I started with my background and ink blended some blue, purple and black onto the cardstock. Then I sponged some Versamark through a star stencil and embossed with some white and gold glitter embossing powder. I kind of messed up because I didn't think I'd gotten any versamark through the stencil so I went in a second time but of course it wasn't lined up and I had gotten Versamark on initially...lol! But I'm good with it... it's just a little more distressed than my initial plan...lol! The buildings and bats create the design that is in the sketch. I'm also linking this one up to the Simon Says Stamp Monday Challenge which has a theme of Starry Night this week! 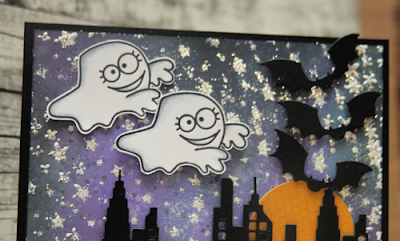 Love the adorable ghosts in the Spookalicious stamp set! They're not really in the sketch... but that's ok... they're part of the "background"...lol! 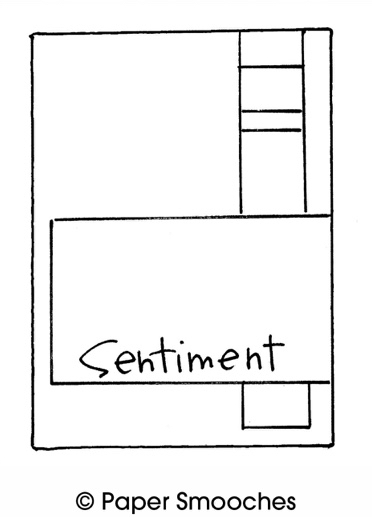 I use sketches quite loosely most of the time. The cool bat die cuts were cut with the Halloween Icons dies. And these buildings from the Super 2 Dies... so cool! And the sentiment is from Spookalicious... so sweet, right? Hope you'll play along! And don't forget that we're all about Fall/Halloween over at Three Amigos this month too!! So CUTE! LOVING the ghosts!!!!! What a darling Halloween card. Such cute spooks too! Love your explanation on your sketch challenge with including the ghosts as your background...clever you are as always. Excellent Halloween scene and thanks for sharing this with us at Double Trouble and The Paper Girls and don't forget to come back with other Halloween projects you create or Fall at Double Trouble. This is such a fabulous card! I love how you created an entire scene here. The sky is so pretty and I like how you're paired sophisticated techniques with adorable imagery! This made me smile and I especially like the sentiment. This came together perfectly and I'm go glad you shared it with us here at the Simon Says Stamp Monday Challenge Blog! Spooktacular card Lisa. Thanks for joining us at Double Trouble. Lisa this card is amazingly spooky, I LOVE it! Those little ghosts with the city skyline are a perfect combo. Thank you so much for joining us Paper Girls in our Halloween themed challenge! Love the layers and dimension! So glad you popped by our Halloween challenge at the PaperGirls, partnered with Double Trouble! Happy Halloween!